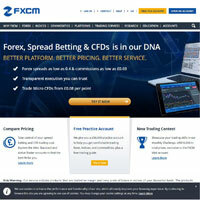 FXCM is one of the biggest players in the world of online stock trading. With hundreds of thousands of customers and more than $300 million being traded with them weekly they certainly have some weight in the market. Consequently FXCM has offices all over the world and direct relationships with many of the world´s largest financial institutions. Their size not only means that they can offer very low spreads and commissions but also that users are able to trade on a "no dealing desk" basis. This means that instead investing with a broker, users trade directly with liquidity providers with FXCM adding just a small mark up. As well as low spreads, this results in higher liquidity meaning that you are more likely to be able to buy or sell exactly when you want to. This is opposed to other brokers who may simply not have the "cash" needed to liquidize your assets resulting in the loss of a favorable market position for you. It must be kept in mind that, despite these advantages there still may arise moments when users are unable to sell and spreads may fluctuate significantly during times of high market volatility. This can lead to a high level of frustration and potential loss of money. However, this is a common complaint of all online stock trading platforms, especially ones such as FXCM which are focused on more speculative, short term trading. Another thing about "no dealing desk" trading is that there is no risk that your broker will be trading against you; basically, hunting down your stop limits in order to make a profit at your expense. To avoid such frustrations FXCM, like most platforms on the market, offer the option for users to set stops and limits meaning that stocks will be automatically bought or sold when they hit a certain price. These features can be very handy and are common place within this category. This function is enhanced with FXCM´s MetaTrader 4 which offers advanced automatic trading and faster, more reliable connections. Although we did not experience any problems we must point out that other users have reported errors with limits which have led to them losing money. All online stock trading sites are required to reimburse you if a technical error which is their fault causes you to lose money. However, how easy this is depends on the level of customer support that different sites offer. This can vary drastically and many users have reported negative experiences with the customer support services of FXCM. We at No1 reviews cannot independently verify this and, on the contrary, we found it easy to get in touch with customer services by both phone and live chat. What did impress us about FXCM is the amount of information available on their Active Trader platform. Their 3D market view really sets them apart from the competition making FXCM a very attractive platform for advanced traders able to make the most of this information. Most platforms simply tell you the price at which stocks, currency pairs, etc. are currently being sold/bought at. FXCM however will tell you the exact quantity available at this price enabling you to buy all available stocks at that price if you are willing and able. Also available is information on the next price band and the quantity within that band to up to 10 levels of market depth. Only traders with a lot of capital and experience will be able to make the most of this feature but for those who do this may give you a real edge in your online trading activity. The market information provided by FXCM is very good; all is up to date and accurate. There is a useful forum where traders can post hints or tips which can be great for valuable tip offs. However, we would recommend that you take these with a pinch of salt and do not base trading decision solely on information from the forum. The reason for this is that people often post completely baseless rumors which, in some cases, are intended to simply inflate the value of stock which they are already holding. We also liked the level of education available with FXCM. There are recorded and live video tutorials available as well as tips and guides to aspects of online stock trading. Users can also progress tentatively into the world of online stock trading without being thrown in at the deep end. There is a 30 day free trial with $50.000 virtual money that you can invest "virtually" on international markets and is a great way to get to grips with the features of the FXCM platform. Once you have made the most of your free trial and you feel ready to progress to trading with real money we would recommend signing up to a Micro Account. This is because the experience of trading with real money will inevitably be different for two reasons. Firstly, using real money will affect the running of the program making it more likely that orders are not executed at the desired price. Secondly, you will be trading differently with real money; whether you are more cautious, erratic, aggressive or serious, this will unavoidably affect your profits or losses. In this way the Micro Account is a great stepping stone between practising and seriously trading. Overall, apart from the customer service and technical errors( reports of which are commonplace throughout this category and are difficult for us to verify), FXCM is undoubtedly a big player in the world of online stock trading and hence offers a combination of some of the best spreads and commissions in this category along with advanced information. The complexity of FXCM may mean that beginners may feel quite lost and may want to begin with something more basic or increase trading volumes with FXCM very gradually. Likewise, we recommend experienced traders to not be too cocky and to take the graduated process outlined above when beginning the FXCM. With prudence you may discover FXCM to be the perfect trading platform for you.